Thank you for taking my Fun Quiz. Now go and amaze your friends, family, and colleagues with your new found knowledge. All classes of people went on pilgrimages to visit the sites of relics. A common relic was a bone from a saint. The pilgrims bought cheap souvenirs, sold by the owners of the relics. What did they do with these souvenirs? is why so few have survived. 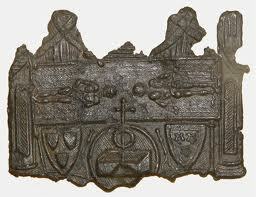 The souvenir pictured here was designed by Lord Geoffrey de Charney and given out at the Easter Masses in 1357 at his church, St. Mary’s, in Lirey, France. This one, discovered in the Seine River in 1855, may be seen at the Cluny Museum, Paris. It is one of a handful known to exist of the thousands that were made of tin and lead from a mold. Part of the mold have also been found. Buttons have been made since antiquity – but only for decoration. The first Button Makers Guild was founded in France in 1250 but buttons had no real use because no one had ever thought of – voila! – buttonholes. What were early buttons made out of? All of the above. And anything else that could be fashioned into a button. In the 13th century, someone in Germany got the idea for buttonholes. Now, buttons were functional. The idea spread in all directions, even to the Middle East, courtesy of the Crusaders. People loved the new, tight-fitting clothing made possible by buttons. Noblewomen became known for the rows of tiny buttons on their sleeves and down the backs of their garments.Decorative with precious stones or utilitarian, all buttons had shanks. 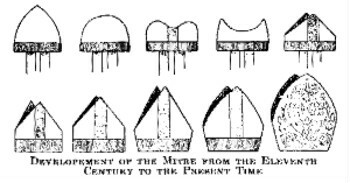 It was not until the 18th century that the button itself was punctured to make holes for fastening it onto a garment. These are military buttons. Note “Paris” on them. Pope John XII (d. 954) said, “The Devil can conceal himself in a mirror.” Still, medieval women of means had small discs of polished brass, enclosed in decorative cases. These were useful only in daylight. The very wealthy had their portraits painted by their court painter. Glass mirrors were not developed until glassblowing was developed in Italy in the 14th century. The silvered glass mirror that we know today was developed by Justus von Liebig, a German chemist, in 1835. In 1378, how many Holy Catholic popes were there? Two. You got it right! In 1378, Pope Urban VI was elected, then the election was nullified by the cardinals and they elected Clement VII. But Urban refused to step down; this was the beginning of the Western Schism. Each pope excommunicated all those who favored his rival. From 1409 until 1414, there were actually three popes. The Council of Constance, 1414-1418, put an end to this, electing an Italian, Martin IV, as pope and naming the Vatican as the permanent home of the Papacy. In 1378 there were two popes, Pope Urban VI was elected, then the election was nullified by the cardinals and they elected Clement VII. But Urban refused to step down; this was the beginning of the Western Schism. Each pope excommunicated all those who favored his rival. From 1409 until 1414, there were actually three popes. The Council of Constance, 1414-1418, put an end to this, electing an Italian, Martin IV, as pope and naming the Vatican as the permanent home of the Papacy. 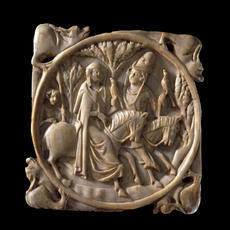 Which of these was NOT a relic venerated in 14th century France? They were all venerated relics, but the Holy Lance did not arrive until the 15th century. In 1489, it was sent to Rome as a gift from Sultan Bayezid II to Pope Innocent VIII. It was welcomed with a parade and a celebration. 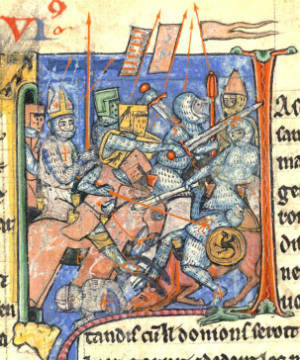 This is a depiction of the Crusaders carrying the Holy Lance. Tripped up by a date. Who were avid readers in the 1300s in France? Kings had scribes. Parish priests were allowed only to read what the Church sanctioned. Knights had little time for reading. The readers who devoured everything they could get their hands on were the noblewomen who were virtual prisoners in their castles, with little to do. They read about King Arthur, about Roland. 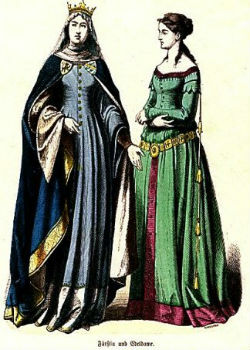 They loved romances; one was titled The Chastelaine de Vergy. They also read forbidden books, such as Ovid’s Metomorphesis. 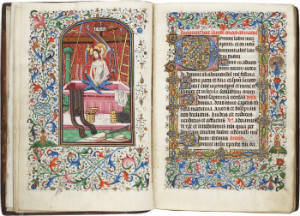 This is A Book of Hours printed in Bruges, Flanders in 1425. 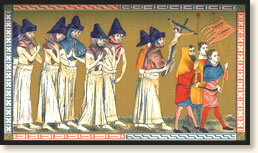 What article of knights’ apparel did popes rail against in the 1300s and 1400s? It was all about the shoes! In 1362, Pope Urban V issued an edict that banned pointed shoes, called poulaines, the “fashion of the Devil.” They were believed to be a cause of the Black Plague (God’s punishment). 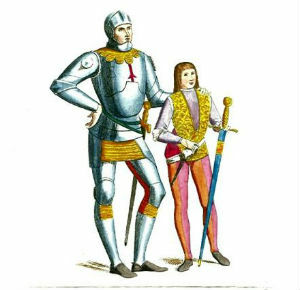 They were the subject of laws – knights could have pointed toes as long as 24”; commoners’ pointed toes could not exceed 6”. 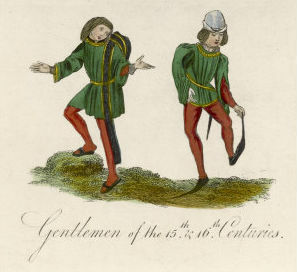 When knights danced, they had to ties the points to their calves. The popes railed about the shoes! In a castle, who was the authority on how to care for babies and children? They went by the book. The authority was a book written in 1256 by Aldobrandino, an Italian physician from Siena who had relocated to Paris. It included everything from how many baths a day and how many diaper changes to how to calm a crying baby..
At what age was a noble son sent to another castle to begin his apprenticeship? Yes, it was 7! The little boy was sent to a strange castle and became part of the contingency of pages there. As a page, he ran errands for the ladies of the castle and helped the knight put on his armor for jousts. At 14 or 15, he advanced to the position of squire and accompanied his knight to battle, where he helped with armor and horses. At 21, he was eligible for knighthood, but many royal sons were knighted at far younger ages. At 8, a girl was considered an adult. Girls were married at very young ages, but were not considered as sexual partners until after their first menses. Thirteen and fourteen were common ages for the births of first children. It was 7! The little boy was sent to a strange castle and became part of the contingency of pages there. As a page, he ran errands for the ladies of the castle and helped the knight put on his armor for jousts. At 14 or 15, he advanced to the position of squire and accompanied his knight to battle, where he helped with armor and horses. At 21, he was eligible for knighthood, but many royal sons were knighted at far younger ages. At 8, a girl was considered an adult. Girls were married at very young ages, but were not considered as sexual partners until after their first menses. Thirteen and fourteen were common ages for the births of first children. The Flagellants were monks who walked from town to town, whipping themselves bloody, in order to atone for the sins of mankind and thus put an end to the Black Plague. They began in the Netherlands in 1349, the year after the Black Plague first arrived there. In fact, they were probably spreaders of the plague, which first devastated Europe from 1346 to 1352. What percentage of the population of Venice died during that first outbreak? Accurate statistics do not exist, but at least 60% of the Venetians died. Worldwide, the plague is estimated to have killed 25-30 million on its first deadly swath. A hundred years later, there were far less people on earth. Between 1346 and 1667, there were 17 major outbreaks of the plague, some not letting up for an entire year. It was not until 1894 that the cause was discovered – fleas on animals, especially black rats. Bubonic Plague has not been eradicated. 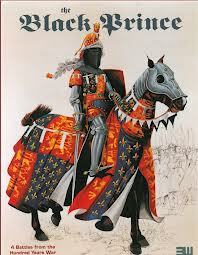 BONUS QUESTION: For all you 13 and 14 century fanatics, who was the Black Prince (1330-1376)? The Black Prince, who did indeed appear in jousts incognito, was Edward of Woodville, Prince of Wales, the first born son of King Edward III. A fearless warrior, he won his first battle at the age of 16, when he led the English to a crushing defeat against the French at Crecy, France in 1346. He died in 1376, probably of pleurisy, thus he was never king. When King Edward died the next year, Edward of Woodville’s ten-year-old son, Richard, became king of England. He was not called the Black Prince in his lifetime. That name was given to him by the historian John Leland in the 1530s. Take the quiz and see how you stack up against others.